Christian Scott aTunde Adjuah and his band performed their Tiny Desk set in 2015. 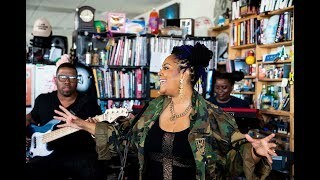 NPR's Tiny Desk concert series has spotlighted hundreds of groups over the past decade, performing original material at the desk of All Songs Considered host Bob Boilen. 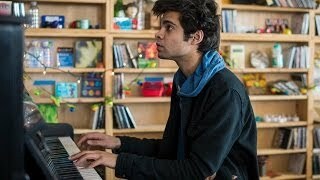 Listen to a sampling of Tiny Desk performances by Berklee alumni. 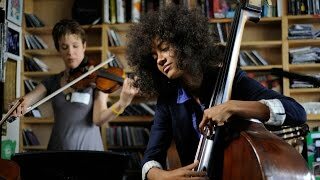 Bassist and vocalist Esperanza Spalding B.M. '05 '18H is known for her fresh blend of jazz, rock, funk, soul, and R&B. She and her fellow performers played several tunes from her third album, Chamber Music Society, in their 2010 Tiny Desk performance. Indie rock band Big Thief is composed of Berklee alumni Adrianne Lenker, Buck Meek, James Krivchenia, and Mark Oleartchik. They began playing together after graduation in Brooklyn, where they're still based. 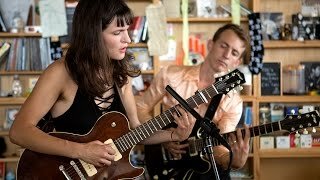 Big Thief performed a Tiny Desk set soon after releasing their debut album, Masterpiece, in 2016, with several songs from the record, including the title track. 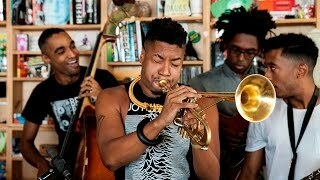 In his 2015 Tiny Desk set, trumpeter and composer Christian Scott aTunde Adjuah B.M. '04 shared the story behind his song "K.K.P.D." With his band, Scott played that tune and two others from his jazz fusion album, Stretch Music. Soul singer Lalah Hathaway B.M. '94 paid tribute to Boston, which became her second home during her years at Berklee, in her Tiny Desk set. She also sang about modern-day romance in "Change Ya Life" and drew on the complicated legacy of the Civil Rights Movement in "Honestly." All five original members of Lucius are Berklee alumni, but the group came together in Brooklyn after college. Their 2012 Tiny Desk concert featured songs from their self-titled debut EP, which swings from sixties girl-group pop to soulful folk and back again. Pakistani musician and TED senior fellow Usman Riaz learned classical guitar at a young age, but taught himself to play other instruments and compose music using the internet. His 2014 Tiny Desk set featured percussive guitar, piano, and harmonica. Prolific singer-songwriter Aimee Mann B.M. 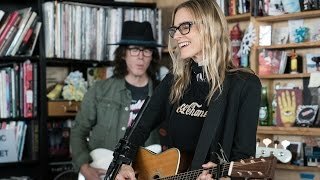 '80 performed songs from her latest album, Mental Illness, at a Tiny Desk concert in 2017. She joked about the songs' "depressing" feel, but the audience responded to her honesty and warmth. 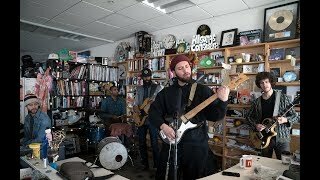 Queens-based neo-soul musician Nick Hakim came back home to D.C. for a Tiny Desk set in early 2018. He performed several songs from his 2017 record, Green Twins. Tiny Desk audio director Josh Rogosin talked about the human side of sound engineering at a Cafe 939 event. Toki Wright, an internationally recognized MC, producer, writer, radio host, arts diplomat, and community organizer, has been named assistant chair of the Professional Music Department.